Notice the dim dot on right near tree. That's Venus! (I think). 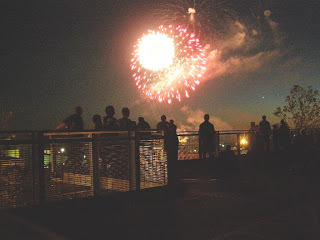 Just got around to putting my images on-line, from Bellingham 4th of July fireworks. I know, lots of people upload fireworks this time of year. The 4th is over for another year, but there is still celebration. Bellingham's Gay Pride Festival is coming this weekend. Sunday, July 15, Noon to 5 PM at Depot Market Square (where Farmer's Market is held on Saturdays). Actually there are events for Pride this entire weekend. Bellingham is coming more of age when it comes to the "urban trait of exhibiting diversity." Celebrating freedom and open mindedness.